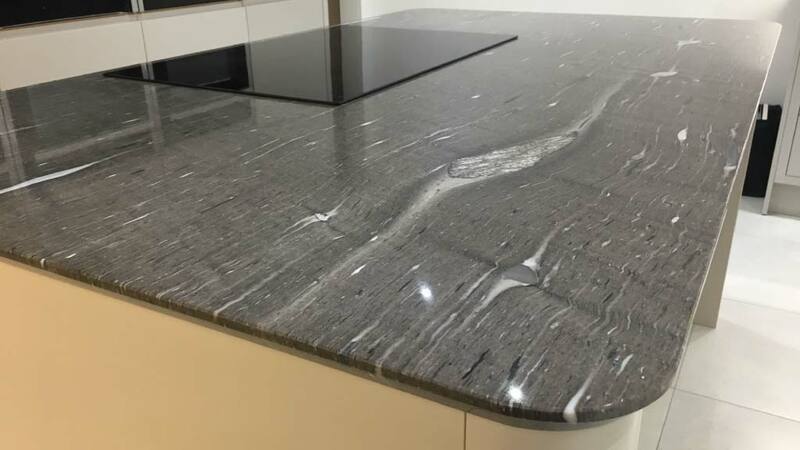 Alexanders supplies granite worktops to Warrington quarried from natural deposits all over the world including; Italy, Spain, India, Brazil, China, the United States and Canada. Granite is extracted from the ground in large blocks and cut into smaller slabs to ease transit. The granite is expertly and carefully cut to the length, depth and width of a kitchen worktop. An accurate template is created ready to be fabricated to exact specifications. Finally, the worktops are delivered to Warrington and fitted at their destination. The natural formation of granite is the foundation of its unique appearance. Not only is it a tough and durable material but it is the epitome of individuality. Unlike Quartz kitchen worktops no two slabs are identical. The character and patterning of a single piece of granite creates a one of a kind beautiful classy result. It is these characteristics that make granite a popular choice with Painted In-Frame Kitchens and Solid Wood kitchens. That character amplifies the overall look and feel. In addition to heat, granite worktops are naturally resistant to scratches, stains and bacteria. It is the most scratch resistant of all-natural stones used in the fabrication of kitchen worktops. The polished sheen leaves bacteria with no room to hide when cleaning kitchen worktops. With proper care it will not be affected by citric acid, coffee, tea, alcohol or wine. Granite holds certain properties to aid with the preparation and cooking of food. It can withstand temperatures up to 1200 degrees Fahrenheit allowing hot pots and pans to be placed on the worktop without fear of damage. It’s natural coolness helps in the preparation of pastry and dough, making it a popular worktop choice with professional chefs and caterers. Professionally fitted and properly maintained with Ph neutral cleaning products, granite worktops will last and look great. There are many different variations of this stone available across the world. The samples available in our Warrington showroom are listed under standard industry names. Occasionally confusion can be created through different names being applied to any given sample. Granite slabs fabricated are chosen for their consistency in colour and gradient but are of course 100% naturally formed stone. Inclusions and sometimes even fossils can be found in granite making this worktop type a unique feature in any kitchen. Solid granite worktops are 30mm thick and typically fabricated to between 600mm – 650mm in depth. The standard kitchen base unit depth is 570mm plus the thickness of the doors. However, granite worktops can also be fabricated into bespoke depths up to 2400mm, often used for kitchen islands or breakfast bars. Worktop lengths can be any size up to 3200mm, the maximum length granite slabs are cut for transit from mine to workshop. Every kitchen is unique, wall dimensions and kitchen unit dimensions can vary therefore granite worktops need to be designed to exact specifications. Alexanders Warrington based kitchen designers discuss the worktop design features and take accurate kitchen measurements before completing their accurate template. A detailed plan gives both the customer and Fabricator clear instructions of what the customer requires. Under-mounted kitchen sinks are becoming increasingly popular in modern kitchen design. The work surface that sits on top of the sink needs to be durable and water-resistant. Solid worktops offer a stylish and practical solution. The under-mounted sink hole, cut into the stone surface, is polished to form an almost impermeable water-proof barrier. Polished drainer grooves will run excess moisture back into the under-mounted sink. Holes, or cut-outs, are made in granite worktops to accommodate sinks, taps and certain kitchen appliances. A polished cut-out is made for an under-mounted kitchen sink. The polished edges of the cut-out sit above the under-mounted sink bowl. Drainer grooves are cut into the granite next to the under-mounted sink, as well as a hole for a kitchen tap. Cut-outs can also be made in the granite on top of a kitchen island or breakfast bar. Accommodating Pop up sockets or Wireless charging spots are amongst the most recent requests. In some instances, our Warrington customers have chosen a Flushline hob. This type of appliance is designed to sit level with the surface of the worktop and will require a polished perimeter cut out to the exact specifications of the hob template. An unpolished cut-out is made for sit-on kitchen appliances e.g. a kitchen hob. 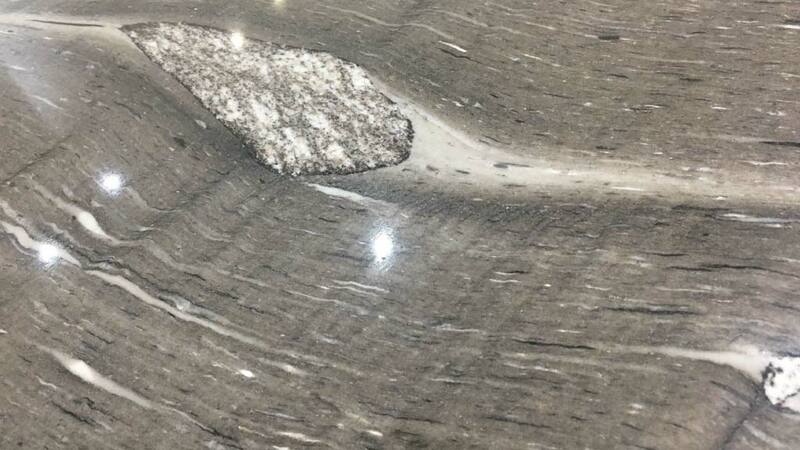 The granite cut-out is not polished because the cut is not seen when the appliance is sat on top of it. Up-stand and splash-back provide a stylish alternative to wall tiling. Up-stands and splash-backs sit against the wall at the back of the worktop. Up-stand has a typical height of 100mm. Splash-back extends further covering all the wall space between worktop and the underside of the kitchen wall units. Up-stands are available in two thicknesses. The industry standard 20mm thickness, or bespoke 30mm ‘chunky’ up-stand. The average UK kitchen has approximately 6 meters of worktop, therefore multiple pieces of granite are required and may need to be joined together. It’s important that joins are as close together as possible and that both edges are accurately straight and level. This is also the case with Quartz Kitchen Worktops. Alexanders Kitchens supplies Accurate, Strong and Square Cabinetry ensure the worktops have the best foundation to achieve a perfect joint. The worktop fabricators and fitters take care to accurately fix adjoining pieces together. Alexanders Kitchens uses the popular square pencil granite edge detail as standard for their granite worktops. Other Various edge details are also available to customers on request. Edge detail can complement unique kitchen doors styles for example: Sharks Nose Edge detail looks particularly impressive combined with the latest handleless kitchen styles. A granite overhang is the distance of granite that overhangs a kitchen base cabinet. Overhangs are commonly used for kitchen islands and breakfast bars. The overhanging distance provides easier access when sitting at a kitchen island or breakfast bar. Overhangs are usually around 300mm to allow comfortable seating. Granite worktops are templated before fabrication, delivery and installation. A template is accurately taken from the kitchen base cabinets ready to be used in the fabrication process. Your kitchen designer will be present to oversee the template process ensuring all details are translated to the template. Granite slabs are then expertly cut and polished to the specifications of the templates. The completed granite worktops are then carefully transported from the workshop to the customer’s home where they are permanently installed. The Installation process usually takes between 1 – 3 hours. Worktops in Warrington and surrounding areas are delivered and fitted within 5 working days from the point of template unless requested otherwise. If you have any questions about granite worktops in Warrington please contact Alexanders for more information.